Sometimes when you sail on a really excellent cruise line, you feel and sense that particular and intangible “certain something” that weaves a magical spell on its guests. That phrase in French is “je ne sais quoi” – translated to mean “indefinable or elusive” or as “an intangible quality that makes something distinctive.” It’s often used to describe a charming woman – and in this case the female in question is the gorgeous Seabourn Encore, newest super-yacht in the Seabourn fleet. When I sailed on this ship for a week last month, this expression came to mind on a number of occasions and I determined I would try to put words to those feelings about my time onboard and why I felt it to be so delightfully luscious and fulsome. There are occasions on some ships when one can revel and delight in the small moments and attentive service. At other times, as you look around and see fellow guests absolutely enthralled by an onboard experience, you can literally sense and touch what is occurring. There is a certain sensibility to product delivery and with some cruise companies – the ones at the top of their game -- it is a delicious and delightful feeling to be the recipient of the care and attention proffered by a competent and highly-trained crew and service staff. 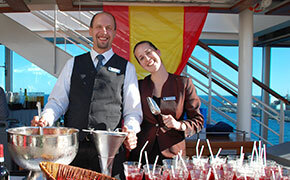 It is something inherent in how the cruise company defines their service level, their style and their inclusions. It’s about an unwavering commitment to the highest guest satisfaction. I noted a number of “Seabourn Moments” when I was onboard Encore. Some seemed familiar, others quite new. I had not sailed on Seabourn for a few years (my loss) and so it was fascinating for me to see how the experience has been morphed – and so very well. I am a stickler for attention to detail. I expect the best and I do not put up with poor service or even less than stellar service, especially on a luxury brand of any kind – ship, hotel or airline. Seabourn delivers and they do so in an exceptional fashion, literally all of the time. And if they don’t, if a staff member may falter briefly, they fix it right away and with great charm and style. I will often do a Vanessa “test” on a few points on ships – just to see how the staff respond and how quickly I can be assisted. 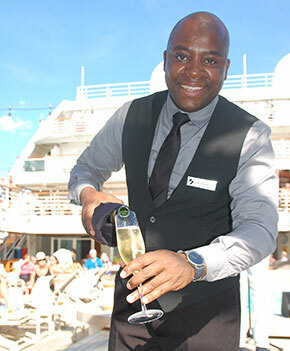 Seabourn Encore and her brigade of staff came through with flying colours. 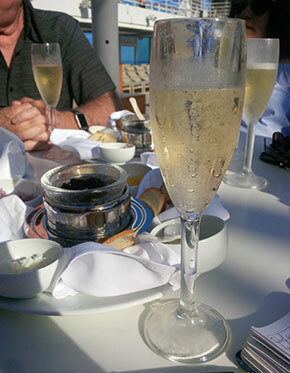 One of the first “moments” for me was at a ‘Classical Caviar Sail Away’ from Santa Margherita on Day 4 of our cruise. It was a beautiful late afternoon and most guests were gathered poolside, some still in swimwear. 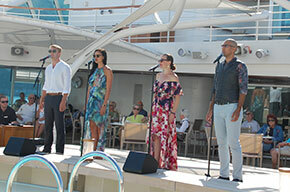 The talented Seabourn Singers (two male and two female) sang for us on the pool deck as we were served champagne and caviar – and lots of it! They performed a stunning set of classical music with costumes to match – light opera and some well-known tunes. It was a fabulous performance, especially a duet from Carmen which literally had the audience offering an ovation. This was a well-thought-out 45 minutes or so at just the right time of day and with just the right amount of songs. Everyone wanted more (especially of the caviar) and all of us were riveted by these charming young people. A huge success. Every evening in the Observation Bar high up on Deck 11, guests would gather for a pre-dinner cocktail and enjoy a veritable feast of tapas. I could not believe how much food was offered in two stations in this lounge. All delicious and perfect for light bites. Music was played by a pianist and at times we heard from a vocalist as well. The point here is that these were not a few small hors d’oeuvres offered around – this was an amazing and tasty repast. So much so that you could have skipped dinner. On another evening, at 9pm poolside, we enjoyed “Mignardises with Dancing Under the Stars” and melodies provided by the quartet usually playing in The Club. People danced up a storm and waiters served delicious and tiny sweet morsels – we might call them petits fours – but by any name they were surprising and delightful. Something different, fabulous, elegant and very much appreciated by the guests. The grand finale though, was offered on the last evening of our voyage just as we set sail. Dubbed “Officers on Deck” this was a wonderful way to say goodbye – to fellow guests, friends and staff. And they went all out. 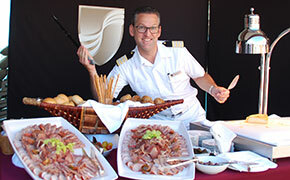 Food stations were set up around the pool offering various wonderful and tasty treats – yes more treats! A superb cheese presentation, caviar – mais oui – buckets of champagne, drinks of every kind, finger-foods, shellfish, sides of Parma ham and so much more. Absolutely fabulous darlings! And, of course, the band played music, people danced and then it was time for a very fond farewell. A great many of the onboard officers and crew appeared on the deck above the pool and sent us off in style – with a happy and memorable crew salute. The higher deck space was ideal for this and it literally brought tears to a few eyes, lots of goosebumps and many happy smiles. Just lovely, and heartfelt too. The examples above are all part of creating a sensibility for a cruise brand. It shows what is important to Seabourn and why it is unique. They have developed marvellous guest engagement moments that work and which the guests love. It is these unexpected and joyous moments that make a vacation unforgettable – never mind all the little extra touches too. If you can give this to your loyal followers – well, in my book, you are simply earning more loyalty and enhancing the relationship. And that’s a very satisfying thought for travel professionals and their valued guests.